Chances are, you do not need any help with what to do with your pulled pork, but here a just a couple of ideas. I am leaving it up to you to gather your own pulled pork. It is such a personal thing, barbecue, so you are on your own. The other day I was craving crackling bread, but alas, no one had any real cracklings. There was a bag at the grocery from a large pork product supplier, but my guess is they were old. Cracklings are just rendered pork skin. 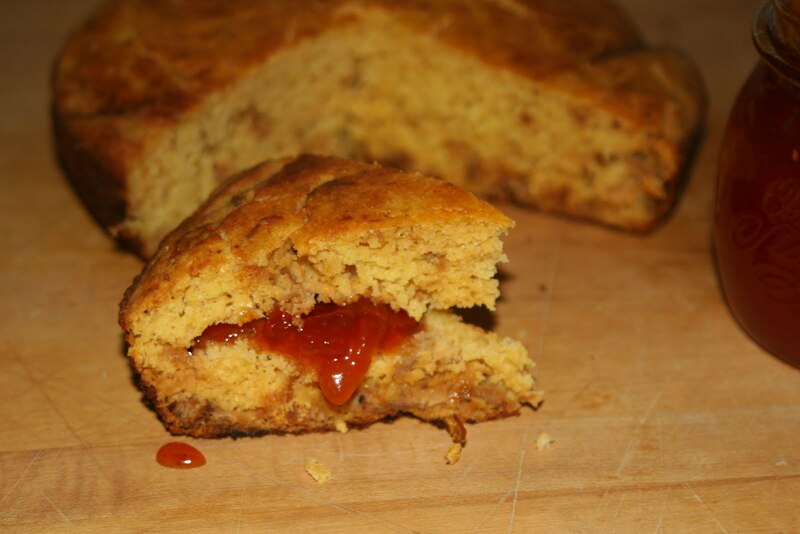 But when added to cornbread, they give it a nice, chewy, crunchy feel. But, as with any cooked product, good cracklings are the key. With no cracklings around, I realized that I did posses some pulled pork. So why not put that in my cornbread? Mix the cornmeal, buttermilk and eggs into a bowl and mix well. Fold in the pulled pork. Place an iron skillet on the stovetop and heat. Add the oil to the hot pan. When the oil is hot, add the batter. Remove from stove and immediately place the skillet into the oven. Cook for about 45 minutes or until the top is brown and cracked. I told you awhile back about making Tomato Confiture from Taste. I opened a jar and I cannot tell you how yummy it was. As you know, the Doe Run Farm specialty is our Three B Pancakes. The three "B's" being buttermilk, Bisquick and bacon. Well, our new specialty is our Three P Pancakes. Pulled Pork Pancakes. This is basically a "serving suggestion" as stated before, you are in charge of your own pulled pork and also in making you own pancakes. 1 pint Jack Daniel's Syrup. 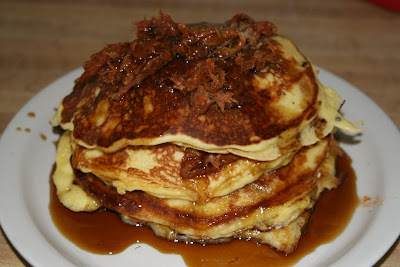 Alternate pancake, pulled pork, syrup. The easiest way to make Jack Daniels Syrup is to heat a syrup you like and add a shot of Jack Daniel's. As a child, I would not eat "dark" syrup. My syrup of choice was plain, clear Karo. This caused a problem when I wanted to eat pancakes in a restaurant...which I seldom did as they always wanted to serve me brown syrup! I find, however, that plain Karo with a shot of Jack Daniel's is just the ticket. Now get out there and barbecue a pork shoulder. Of go to your fave barbecue establishment and grab a pound of their pulled pork. You will be good to go. Helen, Toasted the last slice last night. Ooh, and I just happen to have leftover pulled pork cooked on Sunday. The cornbread is inspiring.